It’s the latest trend in blogging … Tip Jars! They’re popping up all over as a means for visitors to show appreciation of their reading enjoyment by leaving a few dollars behind for the website owner. 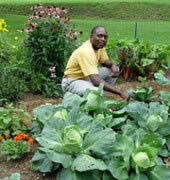 While Veggie Gardening Tips is supported by sales of my Gardening Ebook, I’m not above accepting a good tip or two. Here’s the twist, I’m not asking you to give up your hard earned cash, I’m more interested in your gardening ideas, helpful hints, and those gardening secrets that you use to grow your own terrific vegetable, herb, and fruit gardens. Simply click the “Share a Gardening Tip” link at the top or bottom of this page and you’ll be able to quickly pass along that creative gardening idea, reveal your favorite plant varieties, and share your secrets for controlling insect pests, growing healthier plants, or even a family favorite vegetable recipe.